Extracellular nucleotides activate ligand-gated P2XR ion channels and G protein-coupled P2YRs. In this study we report that intradermal administration of ATPγS, a hydrolysis-resistant P2 agonist, results in an enhanced contact hypersensitivity response in mice. Furthermore, ATPγS enhanced the induction of delayed-type hypersensitivity to a model tumor vaccine in mice and enhanced the Ag-presenting function of Langerhans cells (LCs) in vitro. Exposure of a LC-like cell line to ATPγS in the presence of LPS and GM-CSF augmented the induction of I-A, CD80, CD86, IL-1β, and IL-12 p40 while inhibiting the expression of IL-10, suggesting that the immunostimulatory activities of purinergic agonists in the skin are mediated at least in part by P2Rs on APCs. In this regard, an LC-like cell line was found to express mRNA for P2X1, P2X7, P2Y1, P2Y2, P2Y4, P2Y9, and P2Y11 receptors. We suggest that ATP, when released after trauma or infection, may act as an endogenous adjuvant to enhance the immune response, and that P2 agonists may augment the efficacy of vaccines. Recent years have seen great interest in vaccine development. This has resulted in part from the clinical need for better ways to prevent infection, but there has also been much interest in the development of therapeutic vaccines for tumors and for the treatment of HIV infections (1, 2). New approaches to the production of vaccines include the use of synthetic peptides, DNA, RNA, and protein subunits. These approaches offer a number of advantages, including increased specificity and reduced toxicity (1, 2). However, many are poorly immunogenic when administered alone (1, 2, 3). Currently used adjuvants include mineral salts, immunostimulatory cytokines, lipid particles, microparticulates, and so-called mucosal adjuvants (1, 2, 3). Although the mechanisms of action for some of these, such as immunostimulatory cytokines, may be inferred from what is known of their physiologic activities, the mechanisms of action of many of these are poorly understood. Preclinical and clinical trials have been performed with a variety of adjuvants, and although some have been immunologically effective, most have been too toxic for routine use. At the current time, the only adjuvants proved for use by the U.S. Food and Drug Administration are aluminum-based mineral salts (alum) (1). Despite decades of use, the mechanism of action of alum remains obscure. Recent studies suggest that alum up-regulates costimulatory molecules on APCs and promotes the expression of IL-4. Alum has been associated with local reactions in some individuals and is believed to be a relatively weak adjuvant for cell-mediated immunity and Ab induction to protein subunits. Thus, the development of safer and more effective adjuvants is of great importance. Langerhans cells (LCs)3 are an important subclass of dendritic cells that reside in the epidermis (4). Unlike other dendritic cells, they have a distinctive intracellular organelle (the Birbeck granule), and express the protein langerin (5). Because of their location in the skin, they are in a position to initiate an immune response to pathogens and vaccines that enter through the skin. Thus, they are a population that merits special attention from those who are seeking to administer vaccines by the cutaneous route. The dermis also contains populations of dendritic APCs (6). These are heterogeneous and generally less well-characterized than LCs; however, they are capable of presenting protein Ags, peptide Ags, and tumor Ags in experimental systems (7, 8, 9). Given their location, dermal dendritic cells are also probably important for presentation of Ags administered intradermally or s.c. LCs express high levels of cell surface ATPase (CD39), suggesting that they may be sensitive to ATP (10). Therefore, we hypothesized that agonists of purinergic receptors may augment cutaneous immunity and serve as adjuvants. Our hypothesis also suggests that ATP lost from cells subsequent to trauma or infection may serve as a local signal to enhance the immune response, i.e., an endogenous adjuvant. There are several precedents for this possibility. Monocyte-derived dendritic cells have been shown to express a number of P2Rs of both the P2X and the P2Y series (11, 12). Exposure of monocyte-derived dendritic cells to ATP results in up-regulation of CD54 and MHC class II molecules, induces secretion of IL-12, and augments stimulatory capacity for allogeneic T cells (11, 13). Exposure of LPS-matured dendritic cells to ATP induces the release of IL-1β and TNF-α (12). In combination with TNF-α, ATP has been shown to increase the expression of CD80, CD83, and CD86 in monocyte-derived dendritic cells (11). Furthermore, the ability of dendritic cells derived from murine fetal skin to present Ag was reduced by oxidized ATP, an irreversible inhibitor of P2XRs, and clones of dendritic cells selected for lack of P2X7Rs also had decreased Ag-presenting ability, suggesting a role for this receptor in Ag presentation (14). We report that exogenous administration of a purinergic agonist can enhance cutaneous immunity and provide evidence that it does so by augmenting the ability of LCs to present Ag. These data demonstrate that ATP is an endogenous adjuvant and that the release of ATP during infection or trauma to the skin may result in enhanced cutaneous immunity as a homeostatic protective response. These results also suggest that agonists of P2Rs represent a potentially useful class of therapeutic adjuvants. BALB/c (H-2d), C3H/HeJ (H-2k), and CAF1 (H-2a/d) mice were obtained from The Jackson Laboratory. All experiments were performed in compliance with relevant laws and institutional guidelines and were approved by the Weill Medical College Institutional animal care and use committee. XS106 cells were derived from neonatal A/J epidermis (15). HDK-1 is a T cell clone that responds to presentation of keyhole limpet hemocyanin (KLH) by I-Ad with production of IFN-γ. XS106 and HDK-1 cells were a gift from Dr. A. Takashima (University of Texas Southwestern Health Sciences Center, Dallas, TX). ATP, ATPγS, and KLH were obtained from Sigma-Aldrich. The P2 inhibitors, oxidized ATP, suramin, and pyridoxal-5′-phosphate-6-(2′-naphthylazo-6′-nitro-4′,8′-disulfonate) (PPNDS), were also purchased from Sigma-Aldrich. Groups of five BALB/c mice were injected intradermally on the back with 0.05 ml of PBS or PBS containing 30 nmol of ATPγS. Fifteen minutes later, these mice were immunized by application of 5 μl of 1% dinitrofluorobenzine (DNFB) in acetone/olive oil (4/1) at the injection site. Control mice were injected with medium or ATPγS, but were not immunized. Seven days later, these mice were challenged by application of 5 μl of 0.2% DNFB in acetone to each side of each ear. Ear swelling was assessed with an engineer’s spring-loaded micrometer before challenge and 24 later as previously described (16). The prechallenge ear thicknesses were subtracted from the 24 h value, and ear swelling was assessed as a measure of the CHS response. Groups of five CAF1 mice were injected intradermally with 0.1 ml of a soluble extract (tumor-associated Ags (TAA)) of the S1509a spindle cell tumor (derived from A/J, H-2a) (17) with or without 30 nmol of ATPγS. Negative control mice were injected with PBS alone. TAA were prepared by suspending S1509a cells in PBS at a concentration of 107/ml, subjecting the suspension to four cycles of freeze-thawing, and harvesting the supernatant after centrifugation at 600 × g. One week after immunization, each mouse was challenged in a hind footpad by injection of 50 μl of TAA, and 24 h swelling was assessed by measuring the hind footpads with a spring-loaded micrometer and subtracting the thickness of the uninjected footpad from that of the injected footpad. BALB/c epidermal cells (ECs) were prepared using a modification of a standard protocol (17). Briefly, mice were shaved with an electric clipper and were depilated with topical sodium thioglycolate. Then they were killed, and truncal skin was excised; s.c. fat and paniculus carnosus were mechanically removed. The epidermis was separated from the dermis by floating skins on 0.5 U/ml dispase and 0.38% trypsin in PBS for 45 min. Epidermal sheets were then washed, and a single cell suspension was prepared by mild agitation. LC content was enriched by treatment of ECs with anti-Thy 1.2 mAbs, followed by low toxicity rabbit complement (Cedarlane Laboratories). The cells were then incubated with anti-I-Ad Ab (BD Pharmingen), followed by incubation with goat anti-mouse IgG conjugated to magnetic microspheres (DynaBeads 450; Dynal Biotech). Cells bound to Ab were separated using the magnetic field. By FACS analysis, these cells were >95% LCs. For presentation of Ag to the HDK-1 T cell clone, LCs were plated in 96-well plates at 1 × 104 cells/well and incubated with KLH (50 μg/ml) for 2 h in RPMI 1640 (Cellgro) supplemented with 10% FCS (Gemini Bio-Products), 100 U/ml penicillin, 100 μg/ml streptomycin, 0.1 mM nonessential amino acids, 0.1 mM essential amino acids, 2 mM l-glutamine, 1 mM sodium pyruvate, and 10 mM HEPES buffer (all from Mediatech; complete medium (CM)). ATPγS was added, and cells were cultured for an additional 3 h. The cells were then washed three times and cocultured with 5 × 104 HDK-1 cells. Supernatants were collected after 72 h, and the IFN-γ content was measured by ELISA. To examine the ability of cells to present alloantigens, ECs (not enriched for LC content) were gamma irradiated (2.9 Gy) and cultured in 10−6 M ATPγS for 2 h. They were then washed three times, and graded numbers were cocultured in triplicate with 2 × 105 nylon-wool-enriched T cells from the spleens of C3H/HeN mice per well in round-bottom, 96-well plates in CM supplemented with 5 μg/mg indomethacin (Sigma-Aldrich) and 2.5 × 10−5 M 2-ME (Sigma-Aldrich). After 5 days of culture, each well was pulsed with 1 μCi of [3H]thymidine. Eighteen hours later, cells from each well were harvested, and incorporated [3H]thymidine was assessed by beta scintillation counting. XS106 cells were plated in 12-well plates at a concentration of 1 × 106 cells/ml in CM. Cells were stimulated by 1 μg/ml LPS and 50 U/ml GM-CSF in the presence or the absence of graded concentrations of ATPγS. After 48 h, cells were harvested for FACS analysis, and supernatants were harvested for analysis of cytokine content by ELISA. For FACS analysis, cells were stained with FITC-conjugated anti-mouse I-Ak (BD Pharmingen), PE-conjugated anti-mouse CD86 (BD Pharmingen), or PE-conjugated anti-mouse CD80 (BD Pharmingen). In some experiments examining the induction of IL-1β production, cells were pretreated for 1 h with suramin, oxidized ATP or PPNDS before addition of ATPγS. Cells were washed three times to remove the inhibitors before addition of ATPγS or were not washed. OptEIA sets of capture Ab and biotinylated detection mAb for murine IL-1β, IL-10, and IL-12 p40 were purchased (BD Pharmingen). One hundred microliters of capture Ab (4 μg/ml in coating buffer) was added to each well in 96-well, flat-bottom plates and incubated overnight at 4°C. Then each well was aspirated and washed three times with PBS-Tween 20 (0.05%). Wells were blocked with 200 μl of 10% FBS in PBS, followed by aspirating and washing each well three times with PBS-Tween 20 (0.05%). One hundred microliters of each standard and sample were then added to wells. After incubation at room temperature for 2 h, each well was aspirated and washed five times with PBS-Tween 20 (0.05%). Then 100 μl of detection Ab (1 μg/ml) was added to each well, followed by incubation at room temperature for 1 h. Wells were aspirated and washed five times with PBS-Tween 20 (0.05%). Then 100 μl of avidin-HRP (1/2000) was added to each well, followed by incubation for 30 min at room temperature. After aspiration and washing of each well seven times with PBS-Tween 20 (0.05%), 100 μl of substrate solution (tetramethylbenzidine and hydrogen peroxide) was added to each well at room temperature in the dark. Fifty microliters of 1 M H3PO4 was added to each well to stop the reaction, and wells were read at 450 nm. P2Y1, P2Y2, P2Y4, P2Y5, P2Y6, P2Y10, and P2Y11 primers were designed from mouse sequences in GenBank: P2X1: forward, 5′-CATTGTGCAGAGAACCCAGAA-3′; reverse, 5′-AT GTCCTCCGCATACTTGAAC-3′; P2X7: forward, 5′-GGCAGTTCAGGGAGGAATCATGG-3′; reverse, 5′-AAAGCGCCAGGTGGCATAGCTC; P2Y1: forward, 5′-AGCAGTTTCCTCTTCATTCC-3′; reverse, 5′-CCGAGTCCCAGTGCCAGAGT-3′; P2Y2: forward, 5′-CGTGGGGGAGAGTAGTGTAG-3′; reverse, 5′-GGGAGGGGAGATAGAGGAGA-3′; P2Y4: forward, 5′-AGCCCAAGTTCTGGAGATGGTG-3′; reverse, 5′-GGTGGTTCCATTGGCATTGG-3′ reverse primer; P2Y9: forward, 5′-ACCATCAGGCCAGGAGGAA-3′; reverse, 5′-ACAAAGCATACCACAAACAC-3′; and P2Y11: forward, 5′-TGTATTCTTTATTTGCTTTG-3′; reverse, 5′-CGTCCCTTTGGTTTTGTTGT-3′ reverse primer. Briefly, 0.1 μg of total RNA from XS106A cells was incubated in a reaction mixture containing 5 mM MgCl2, 50 mM KCl, 10 mM Tris-HCl, 1 mM dNTPs, 2.5 μM random hexamers, 1 U of RNase inhibitor/μl, and 2.5 U of Moloney murine leukemia virus reverse transcriptase/μl in 20 μl for 10 min at room temperature for the extension of the hexameric primers, for 15 min at 42°C for annealing, and then for 5 min at 99°C to denature the enzyme. Twelve microliters of the reverse-transcribed reaction was transferred to a PCR mixture for the receptors, and 6 μl of the reverse-transcribed reaction was transferred from the same tube to a PCR mixture for GAPDH as an internal control. The reaction mixture consisted of 50 mM KCl, 10 mM Tris-HCl, 2 mM MgCl2, 0.5 μM primers, and 1 U of AmpliTaq DNA polymerase in a total volume of 40 μl. After denaturation for 5 min at 95°C, 25–40 cycles of denaturation for 30 s at 95°C, annealing for 30 s at 55°C, and extension for 30 s at 72°C were repeated with a thermal cycler, followed by completion for 50 min at 72°C. The PCR products were electrophoresed in 1% agarose gel, stained with ethidium bromide, and visualized with UV radiation. The significance of differences among groups was measured by Student’s two-tailed t test for unpaired samples (Excel software; Microsoft). To determine whether P2Rs modulate the immune response, we determined the effects of purinergic agonists on CHS. Groups of BALB/c mice were injected intradermally on the dorsum with vehicle alone or 30 nmol of ATPγS, a stable analog of ATP that interacts with purinergic receptors (18). Fifteen minutes later, these mice were immunized by careful application of DNFB at the injected site or, in some experiments, at a site contralateral to that of the injection. Nonimmunized control mice were similarly injected with ATPγS or medium alone, but were not immunized. Seven days later, all mice were challenged on the ears by application of 0.2% of DNFB in acetone, and 24 h ear swelling was assessed as a measure of the CHS response. Intradermal administration of ATPγS at the site of immunization (but not at a distant site) significantly increased the CHS response (Fig. 1⇓), supporting the hypothesis that P2 agonists enhance immune responsiveness. Intradermal ATPγS augments the induction of CHS. BALB/c mice received an intradermal injection of either ATPγS or PBS alone on the lower back. Fifteen minutes later, mice were sensitized by application of DNFB to the same area or at a distant site. Seven days later, all mice were challenged by DNFB application to the ears. Ear swelling was measured at 24 h. Mice initially sensitized to DNFB showed significant swelling upon DNFB challenge compared with mice not sensitized to DNFB. Mice injected with ATPγS before DNFB application at the injected site had an increased response upon challenge compared with mice injected with PBS alone at the site of injection (∗, p < 0.05). Injection of ATPγS at a site distant from that of immunization had no effect on the response. Shown are the mean ± SD (n = 5/group). This experiment is representative of three performed. To examine whether ATPγS enhances immunity induced by a vaccine, we immunized CAF1 mice by intradermal injection of either TAA or TAA containing 30 nmol of ATPγS. Negative control mice were not immunized. One week after the last immunization, each mouse was challenged in a hind footpad with TAA, and footpad swelling was measured as an indication of immunological responsiveness. 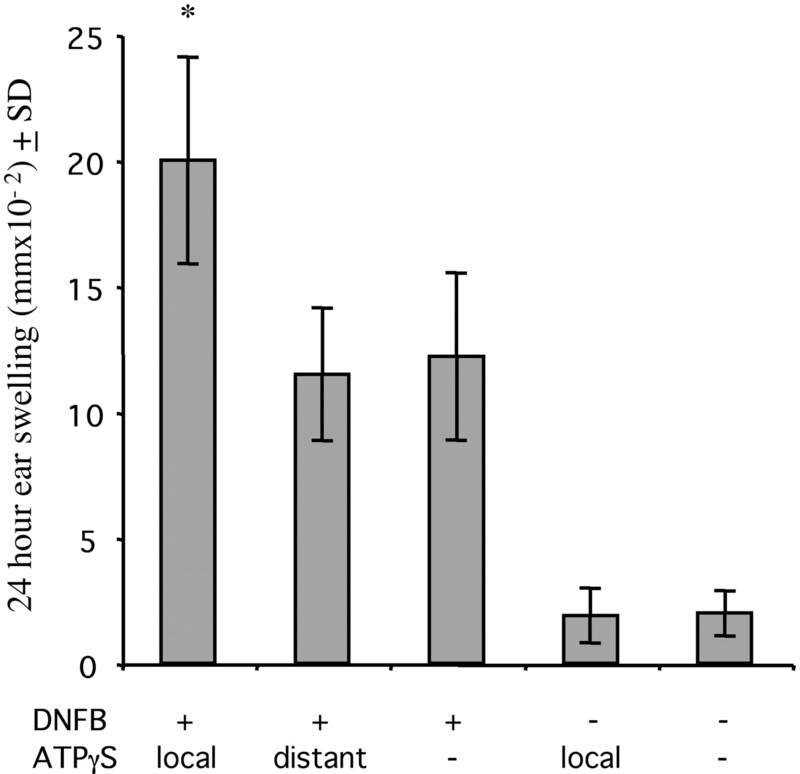 ATPγS significantly enhanced the DTH response at 24 h (Fig. 2⇓), again supporting the hypothesis that P2 agonists enhance immune responsiveness. Assessment of the DTH response at 48 h yielded the same results (data not shown). Mice immunized with TAA and ATPγS showed an enhanced DTH response compared with mice immunized with TAA alone. CAF1 mice received an intradermal injection of TAA, TAA mixed with 30 nmol of ATPγS, or PBS alone. 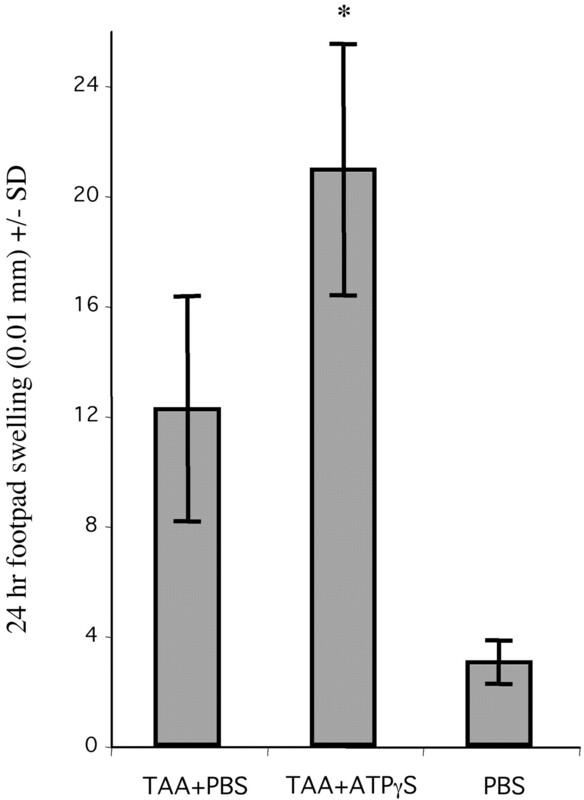 One week later, each mouse was challenged by footpad injection with TAA, and footpad swelling was measured at 24 h. Mice immunized with TAA and ATPγS exhibited a significantly greater DTH response than mice immunized with TAA alone (p = 0.013). Shown are the mean ± SD (n = 5/group). This experiment is representative of two performed. The increase in immune responsiveness could occur by several mechanisms. One possibility is ATPγS enhances Ag presentation in the skin. To determine whether ATPγS increases the Ag-presenting ability of LCs, we examined whether ATPγS would enhance Ag presentation to the T cell clone HDK-1. This cloned line responds to presentation of KLH by I-Ad with production of IFN-γ. We cultured a population of LCs enriched to >95% in medium alone or in medium containing graded concentrations of ATPγS. After 3 h, KLH was added, and 2 h later, cells were gamma irradiated and washed three times to remove any residual ATPγS. LCs were then cocultured with HDK-1 cells. After 72 h, we harvested supernatants and measured IFN-γ content by ELISA. Exposure to ATPγS resulted in a dose-dependent increase in IFN-γ release (Fig. 3⇓). When LCs were incubated with ATPγS in the absence of KLH, only background levels of IFN-γ were produced. Thus, ATPγS enhanced Ag presentation. At concentrations >10−6 M, the response began to decrease, possibly due to induction of apoptosis, because concentrations >10−5 M induce apoptosis in the LC-like cell line XS106. After 24 h of exposure to 10−4 M ATPγS, ∼3–4% of XS106 cells were dead (by trypan blue exclusion testing), and ∼13–21% were killed with a concentration of 10−3 M, compared with 2–3% dead when cultured in medium without ATPγS. Treatment of LCs with ATPγS enhances the ability to present KLH. LCs were cultured with the Ag KLH for 2 h, then ATPγS was added for an additional 2 h. The cells were washed and cocultured with the KLH-responsive Th1 clone HDK-1. Supernatants were collected after 72 h and analyzed for IFN-γ production by ELISA. 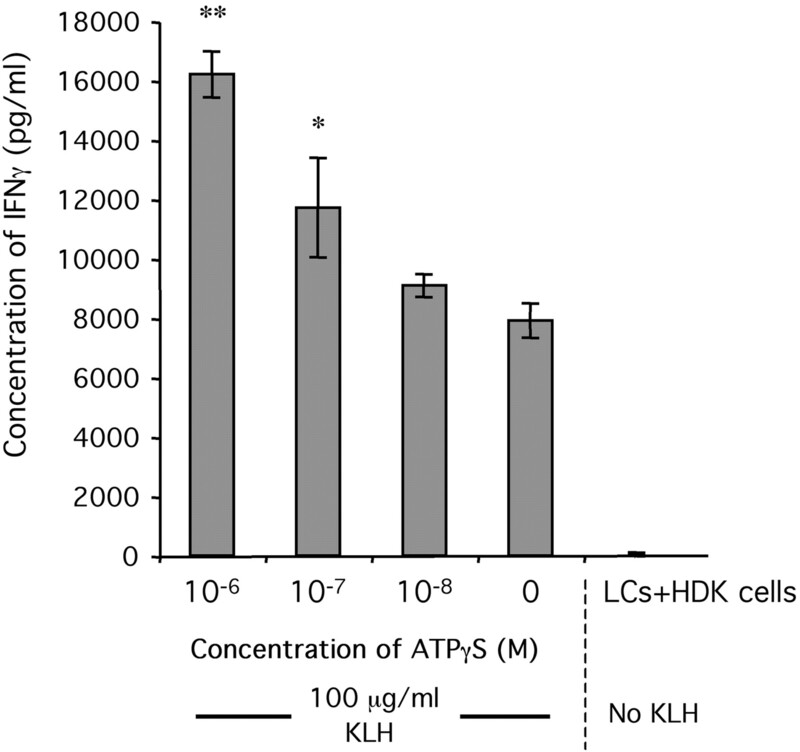 ATPγS augmented the ability of LCs to present KLH to HDK-1 cells in a dose-dependent manner (∗∗, p < 0.01; ∗, p < 0.05 (compared with no ATPγS)). Exposure to ATPγS did not significantly change the background response seen in the negative control group (EC+HDK, No KLH). Shown are the mean ± SD. This experiment is representative of five performed. Although LCs were washed extensively to remove ATPγS before being added to HDK-1 cells, we performed additional experiments to test whether residual ATPγS might be acting directly on HDK-1 cells. When HDK-1 cells (rather than LCs) were pretreated with ATPγS, there was no increase in IFN-γ release (data not shown). To determine the effect of ATPγS on presentation to naive T cells, we examined the ability of ATPγS to modulate the presentation of alloantigens by an unseparated population of ECs to naive allogeneic T cells (i.e., the mixed epidermal cell-lymphocyte reaction). ATPγS (10−6 M) enhanced the ability of ECs to present alloantigens to allogeneic T cells (Fig. 4⇓). Thus, activation of P2Rs on ECs also enhances Ag presentation to naive T cells. Treatment of ECs with ATPγS enhances the ability to present alloantigens. BALB/c ECs were cultured in 10−6 M ATPγS or medium alone for 1 h. The cells were then washed three times and cocultured with C3H/HeN T cells for 5 days in round-bottom, 96-well plates at the ratios indicated (S:R, S refers to ECs; R refers to T cells). ECs treated or not treated with ATPγS were also cultured without T cells. Each well was then pulsed with [3H]thymidine, and cells were harvested 18 h later for measurement of [3H]thymidine incorporation by beta scintillation counting. 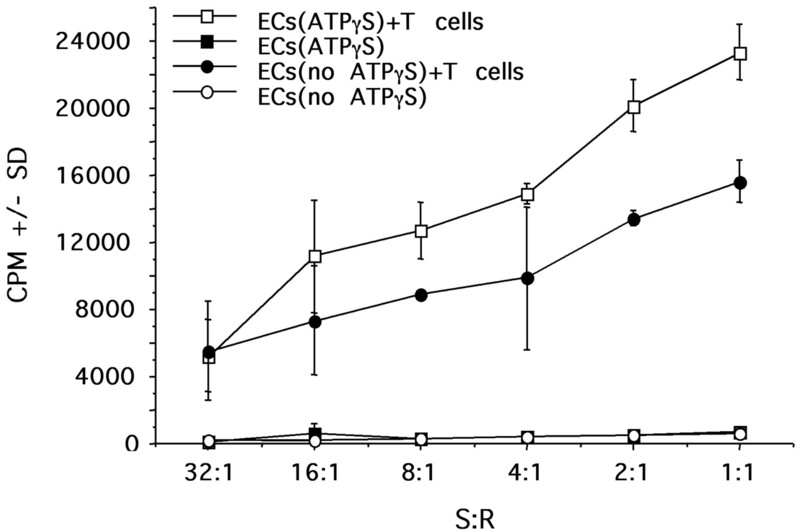 ATPγS augmented the ability of ECs to stimulate allogeneic T cells. Shown are the mean ± SD. This experiment is representative of three performed. To explore mechanisms by which ATP agonists enhance Ag presentation, we studied the effect of ATPγS on XS106, a cloned cell line that was derived from neonatal A/J epidermis and has many of the functional and phenotypic characteristics of LCs (15). 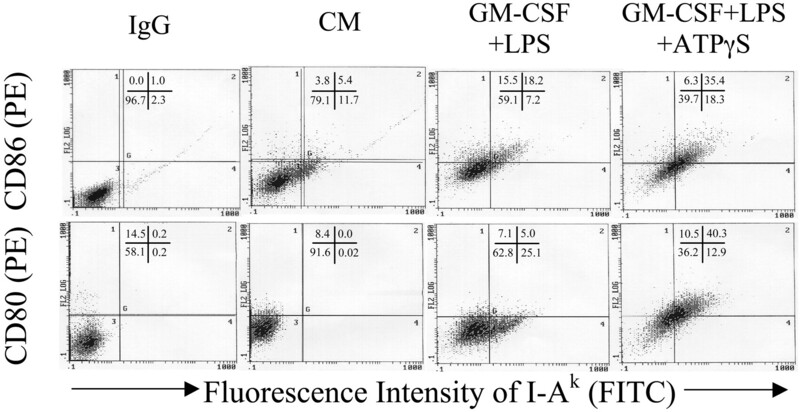 To stimulate the expression of I-A, CD80, and CD86, XS106 cells were cultured in medium containing GM-CSF and LPS in the presence of graded concentrations of ATPγS. As indicated by FACS analysis, expression of three surface molecules that are important for Ag presentation (I-A, CD80, and CD86) was enhanced by exposure to 10−4 M ATPγS (Fig. 5⇓). Because this is a cell line, any effects we observed were presumably due to direct effects of ATPγS on the cells. We conclude that ATPγS can directly modulate LC maturation. ATPγS enhances the expression of I-A, CD80, and CD86. XS106 cells were cultured in CM alone or in CM containing LPS and GM-CSF with or without the addition of 10−4 M ATPγS. Cells were stained with FITC-conjugated anti-mouse I-Ak and PE-conjugated anti-mouse CD80 or PE-conjugated anti-mouse CD86. Negative control cells were cultured in CM and stained with FITC- and PE-labeled isotype control Abs. Cells were harvested at 48 h and analyzed by cytofluorography for the expression of I-Ak, CD80, and CD86. This experiment is representative of two performed using ATPγS and of 10 experiments performed with ATP that yielded similar results. We used a similar strategy to determine ATPγS-modulated cytokine production. XS106 cells were cultured in medium containing GM-CSF and LPS in the presence or the absence of increasing concentrations of ATPγS. After 24 h, we harvested supernatants and measured cytokine content by ELISA. 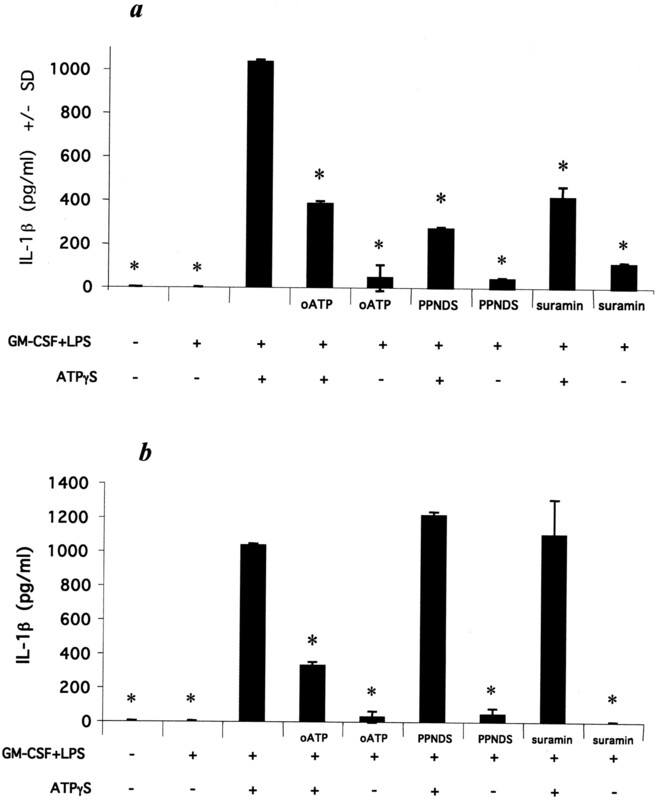 ATPγS significantly increased the release of IL-1β and IL-12 while decreasing the release of IL-10 from GM-CSF/LPS-stimulated XS106 cells (Fig. 6⇓). In the absence of LPS and GM-CSF, ATPγS induced IL-1β release, but to a much lesser degree than in the presence of LPS and GM-CSF (data not shown). The combination of ATPγS and GM-CSF or LPS resulted in greater IL-1β production than ATPγS alone, but still considerably less than when ATPγS was combined with both LPS and GM-CSF (data not shown). ATPγS alone did not induce a detectable level of IL-12 release (data not shown), but it did induce some release in the presence of LPS or GM-CSF (data not shown). However, as shown in Fig. 6⇓b, in the presence of both LPS and GM-CSF, ATPγS greatly augments IL-12 production. Thus, the effects of ATP agonists on immune responsiveness may be explained in part by the regulation of cytokine expression by APCs in the skin, but a detailed understanding of how signaling by ATPγS interacts with signaling by LPS and GM-CSF will require additional work. ATPγS enhances the production of IL-1β and IL-12 p40 while inhibiting IL-10. The LC-like line XS106 was treated with increasing concentrations of ATPγS in the presence of GM-CSF/LPS. Supernatants were collected after 24 h and analyzed for cytokine production by ELISA. Stimulation with ATPγS produced significant increases in IL-1β and IL-12 p40 (a and b) and a decrease in IL-10 (c). Production of cytokines in the absence of GM-CSF/LPS is shown as CM (CM only) in b and c. Experiments were performed in triplicate (∗, p < 0.05; ∗∗, p < 0.01 (compared with no ATPγS)). Shown are the mean ± SD. This experiment is representative of five performed for IL-12 p40, eight for IL-1β, and 10 for IL-10. As a pharmacological test for the involvement of cell surface P2Rs in modulating LC function, we pretreated with agents that are antagonists of these receptors and then measured the effect of ATPγS on cytokine production. XS106 cells were treated with four different P2 antagonists (oxidized ATP, suramin, or PPNDS) for 1 h before addition of ATPγS. Supernatants were harvested for measurement of IL-1β content. All inhibitors tested significantly reduced the response (Fig. 7⇓a). When XS106 cells were washed three times after exposure to the inhibitors, but before addition of ATPγS, only oxidized ATP inhibited the response (Fig. 7⇓b). Because oxidized ATP is an irreversible inhibitor of P2Rs and the other agents are competitive inhibitors, this observation also supports the role of P2Rs in the responses to ATP. Inhibitors of P2Rs suppress ATPγS-induced IL-1β production. The LC-like line XS106 was cultured in each inhibitor at a concentration of 300 μM for 2 h. Then 0.7 × 10−3 M ATPγS was added. Supernatants were collected after 24 h and analyzed for cytokine production using ELISA. Stimulation with ATPγS produced a significant increase in IL-1β that was suppressed by each inhibitor (a). When the inhibitors were washed out before addition of ATPγS, only oxidized ATP showed suppression of IL-1β production. Experiments were performed in triplicate (∗, p < 0.01, compared with no inhibitor, GM-CSF+LPS and ATPγS). Shown are the mean ± SD. This experiment is representative of three performed. All these experiments are consistent with our hypothesis that ATP acts as an adjuvant by binding to cell surface P2Rs. As a direct test for the presence of these receptors, we used RT-PCR. XS106 cells were found to express mRNA for P2X1, P2X7, P2Y1, P2Y2, P2Y4, P2Y9, and P2Y11 receptors (Fig. 8⇓). In each case the PCR product was of the predicted length and was dependent on the presence of RT. Thus, LCs express several different P2Rs, but it is not clear which of these receptors or which combinations of these receptors mediate the effects of ATP on Ag presentation or immunity. XS106 cells express mRNA for P2X1, P2X7, P2Y1, P2Y2, P2Y4, P2Y9, and P2Y11 receptors. By RT-PCR, fragments of the expected sizes were obtained for these P2Rs. Reactions were run without RT to control for the possible presence of contaminating DNA. We have demonstrated that ATP agonists have significant immunostimulatory effects on cell-mediated immunity within the skin. Correlative experiments have demonstrated that these agonists enhance the LC Ag-presenting ability in vitro as well as the expression of MHC class II molecules, CD86, CD80, and proinflammatory cytokines while decreasing the expression of IL-10. These data strongly suggest that the mechanism of action of ATP agonists in vivo relates to immunostimulatory effects on APCs. The ability of P2R antagonists to block the effect of ATPγS on induction of IL-1β release demonstrates that, at least for this end point, the effect observed is dependent on signaling through a P2R. Although the various inhibitors we used have different capacities to block different P2Rs (19), in the absence of detailed dose-response experiments with each inhibitor, it is premature to speculate on which receptor(s) is relevant to the effects we have observed. We have recently obtained preliminary data showing that Abs to the P2X7R can inhibit some responses to ATP, but additional work needs to be performed to establish the importance of this receptor. It also remains possible that ATPγS may signal through non-P2Rs. Of course, the experiments examining the effects of ATPγS on MHC, CD86, CD80, and cytokine expression were performed on XS106 cells, rather than fresh LCs; therefore, the results must be interpreted cautiously. These observations have several important implications. First, ATP is most likely an endogenous regulator of LC function within the skin. Damaged cells are known to release ATP into the extracellular environment (10), and we hypothesize that the release of ATP from keratinocytes after injury or irritation of the skin leads to ATP-induced up-regulation of LC function as a homeostatic protective mechanism. This observation may also explain why contact allergens are invariably also contact irritants; irritation may be necessary for up-regulation of APC function and subsequent induction of immunity to the allergen (20). In this regard, purinergic agonists may represent a class of danger signals that alert the immune system to dying cells in a manner analogous to that recently proposed for uric acid (21). Interestingly, it appears that the stimulatory effect of P2 agonists is maximal in the presence of additional stimulatory signals. In our experiments, LPS and GM-CSF provided these signals. Physiologically, in the setting of infection, such a signal(s) could be derived from a pathogen. The results seen with our CHS and DTH experiments demonstrate that immunity induced with an epicutaneously applied hapten or our intradermally administered vaccine is significantly boosted without an additional signal being supplied, or that the immunogen itself supplies a second signal or induces the release of such a signal endogenously. Second, and most importantly, the immunostimulatory properties of ATP agonists may be exploited for adjuvant activity to enhance the efficacy of vaccines. As stated above, there is great interest in the development of new adjuvants for use with vaccines. All currently available adjuvants have limitations, and the development of novel, more effective, and safer adjuvants could have practical benefits for increasing the efficacy and utility of both prophylactic and therapeutic vaccines. Although additional work remains to be performed, understanding the molecular and cellular mechanisms by which purinergic agonists exert their immunostimulatory effects and the range of immune responses that may be enhanced is of considerable importance. ↵1 This work was supported in part by National Institutes of Health Grant AI59226 (to R.D.G. and J.A.W. ), a grant from the Abercrombie Foundation, a grant from the Edith C. Blum Foundation, contributions from the Ann L. and Herbert J. Siegel Philanthropic Fund, a gift from the Jacob L. and Lillian Holtzmann Foundation, contributions from Mr. and Mrs. Blair O’Connor, and a gift from Call on an Angel. ↵3 Abbreviations used in this paper: LC, Langerhans cells; CHS, contact hypersensitivity; CM, complete medium; DNFB, dinitrofluorobenzine; DTH, delayed-type hypersensitivity; EC, epidermal cell; KLH, keyhole limpet hemocyanin; PPNDS, pyridoxal-5′-phosphate-6-(2′-naphthylazo-6′-nitro-4′,8′-disulfonate); TAA, tumor-associated Ag. Singh, M., D. T. O’Hagan. 2002. Recent advances in vaccine adjuvants. Pharm. Res. 19: 715-728. Hunter, R. L.. 2002. Overview of vaccine adjuvants: present and future. Vaccine 20: S7-S12. Alving, C. R.. 2002. Design and selection of vaccine adjuvants: animal models and human trials. Vaccine 20: S56-S64. Streilen, J. W., P. R. Bergstresser. 1984. LC: APC of the epidermis. Immunobiology 186: 285-300. Nestle, F. O., X. G. Zheng, C. B. Thompson, L. A. Turka, B. J. Nickoloff. 1993. Characterization of dermal dendritic cells obtained from normal human skin reveals phenotypic and functionally distinctive subsets. J. Immunol. 151: 6535-6545. Duraiswamy, N., Y. Tse, C. Hammerberg, S. Kang, K. D. Cooper. 1994. Distinction of class II MHC+ Langerhans cell-like interstitial dendritic antigen-presenting cells in murine dermis from dermal macrophages. J. Invest. Dermatol. 103: 678-683. Kurimoto, I., M. Arana, J. W. Streilein. 1994. Role of dermal cells from normal and ultraviolet B-damaged skin in induction of contact hypersensitivity and tolerance. J. Immunol. 152: 3317-3323. Campton, K., W. Ding, Z. Yan, H. Ozawa, K. Seiffert, E. Miranda, A. Lonati, S. Beissert, R. D. Granstein. 2000. Tumor antigen presentation by dermal antigen-presenting cells. J. Invest. Dermatol. 115: 57-61. Berchtold, S., A. L. Ogilvie, C. Bogdan, P. Muhl-Zurbes, A. Ogilvie, G. Schuler, A. Steinkasserer. 1999. Human monocyte derived dendritic cells express functional P2X and P2Y receptors as well as ecto-nucleotidases. FEBS Lett. 458: 424-428. Ferrari, D., A. La Sala, P. Chiozzi, A. Morelli, S. Falzoni, G. Girolomoni, M. Idzko, S. Dichmann, J. Norgauer, F. Di Virgilio. 2000. The P2 purinergic receptors of human dendritic cells: identification and coupling to cytokine release. FASEB J. 14: 2466-2476. Liu, Q. H., H. Bohlen, S. Titzer, O. Christensen, V. Diehl, J. Hescheler, B. K. Fleischmann. 1999. Expression and a role of functionally coupled P2Y receptors in human dendritic cells. FEBS Lett. 445: 402-408. Mutini, C., S. Falzoni, D. Ferrari, P. Chiozzi, A. Morelli, O. R Baricordi, G. Collo, P. Ricciardi-Castagnoli, F. Di Virgilio. 1999. Mouse dendritic cells express the P2X7 purinergic receptor: characterization and possible participation in antigen presentation. J. Immunol. 163: 1958-1965. Matsue, H., K. Matsue, M. Walters, K. Okumura, H. Yagita, A. Takashima. 1999. Induction of antigen-specific immunosuppression by CD95L cDNA-transfected “killer” dendritic cells. Nat. Med. 5: 930-937. Ding, W., S. Beissert, L. Deng, E. Miranda, C. Cassetty, K. Seiffert, K. L. Campton, Z. Yan, G. F. Murphy, J. A. Bluestone, et al 2003. Altered cutaneous immune parameters in transgenic mice overexpressing viral IL-10 in the epidermis. J. Clin. Invest. 111: 1923-1931. Grabbe, S., S. Bruvers, R. L. Gallo, T. L. Knisely, R. Nazareno, R. D. Granstein. 1991. Tumor antigen presentation by murine epidermal cells. J. Immunol. 146: 3656-3661. Dubyak, G.. 2000. Purinergic signaling at immunological synapses. J. Auton. Nerv. Syst. 81: 64-68. Di Virgilio, F., P. Chiozzi, D. Ferrari, S. Falzoni, J. Sanz, A. Morelli, M. Torboli, G. Bolognesi, R. Baricordi. 2001. Nucleotide receptors: an emerging family of regulatory molecules in blood cells. Blood 97: 587-600. Smith, H. R., D. A. Basketter, J. P. McFadden. 2002. Irritant dermatitis, irritancy and its role in allergic contact dermatitis. Clin. Exp. Dermatol. 27: 138-146.